Instructions: My card size is 4 x 6". Using the tag die lay it on a folded piece of cardstock with the edge hanging off. Run this through the Vagabond and cut out the card. Using the coordinating die, cut a piece of the paper collection and layer it onto the front of the card. Next, cut out the medallion and use the coordinating die to cut a piece of the paper collection. Glue it to the medallion. Use dimensional tape to adhere to card front. Stamp the sentiment onto a piece of white cardstock and use the Tag die to cut out. I went around the edges of the cardstock with Magenta Hue ink. Use dimensional tape to adhere to medallion. Tie a piece of the seam binding into a bow and adhere to the edge of the sentiment. Using StazOn Olive Green ink, stamp the leaves. Using Jet black Archival Ink, stamp the birds. Using Magenta Hue ink, stamp the flower petals. Color the leaves with Bamboo Leaves Memento ink. Color the little birds with Danube Blue and Magenta Hue. Layer everything into the mold, spritz with water and run through the Vagabond 2. Lay everything out to dry. 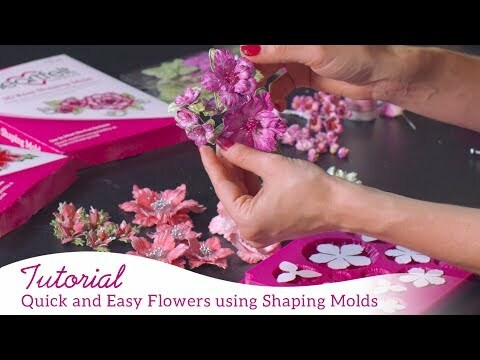 Once dry, layer the flower petals and add glitter and Prills to them and set aside to dry. Add glitter to the little bird and allow to dry. Once everything is dry, decide on placement and glue down.